I've been tickled with my progress on my Red, White and Blue quilt. I ran out of room on my design wall to layout the entire quilt. It's sewn on the diagonal so that makes it just a little more "involved." I started in the top right corner and sewed rows together. So this was suppose to go into a post Wednesday or Thursday. Um, didn't happen. After I get three or four rows done I start another section. See the baseballs near the middle? That row is part of the third set of rows already sewn together. Making steady progress! 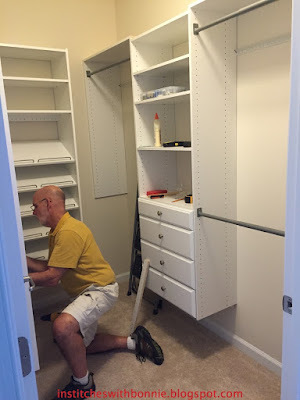 Meanwhile, back at the farm (um, the rest of the house) Pat's been putting in custom closets. This one's mine. Yea! 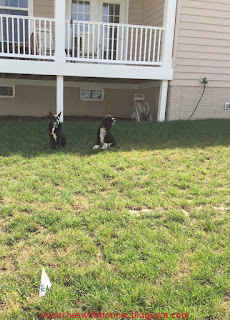 And the dogs have been learning about their new backyard and having an electric fence. They are very unimpressed with both. 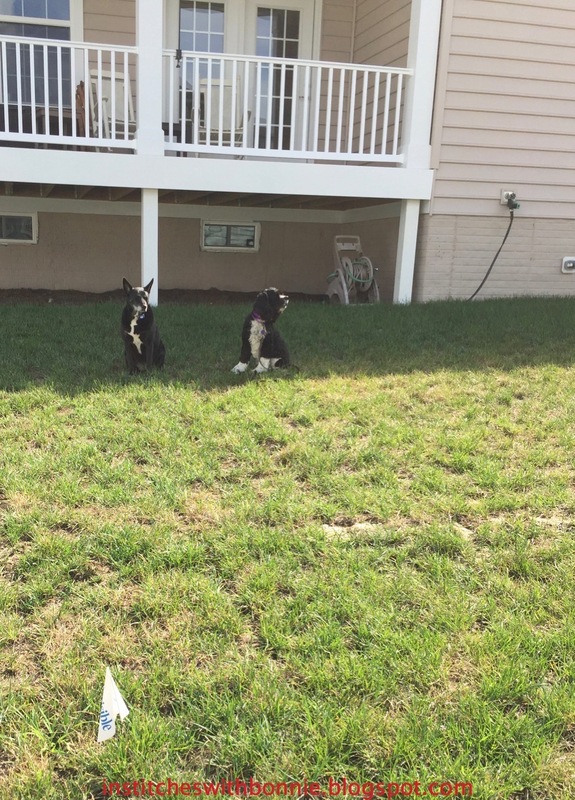 I think they would prefer their fenced acreage at our old house. Sorry guys. That postage stamp is your yard. One last thing in closing -- do you like to do quilt alongs? I've joined one over Color, Creating and Quilting. Janice, along with Jen at A Dream and A Stitch are sponsoring a Shadow Block Mini Quilt Along. The pattern was designed by Debora at Studio Dragonfly. 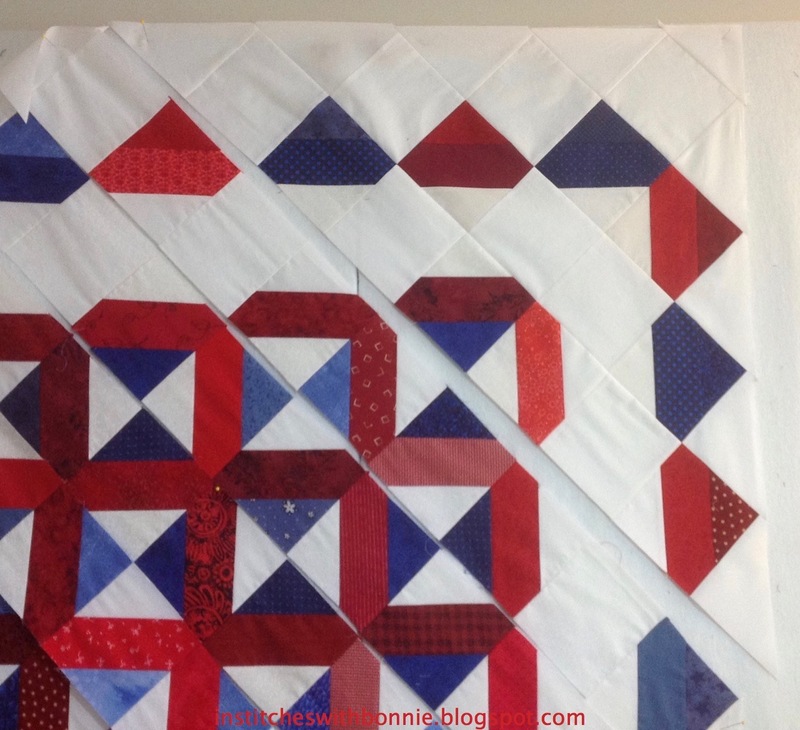 So are you up for making what Janice promises is an easy fast quilt? Drop by Janice or Jen's sites to sign up. The reveal date is Sept. 5th. AGH!, you say? I checked the pattern out and it really will be quick to make and finish. I'm thinking the hardest thing for me is to decide on what fabrics to use. I just had a moment's inspiration. I always give a donation to FCQ guild for a fall silent auction. This would be the perfect thing to use for that and I would be done with it really early! Hope you'll join me. I'm linking up with Can I get a Whoop Whoop over at Confessions of a Fabric Addict. I may come back tomorrow and see what else I can link up with. Nice progress on the quilt - it looks wonderful. I wish someone would updat my closets. Sigh! I've been dealing with them for 20 years. I like your red, white and blue (I've just started something in those colours). Your closet looks amazing! You've made great progress on the quilt, it's looking great. And good progress on the house too. 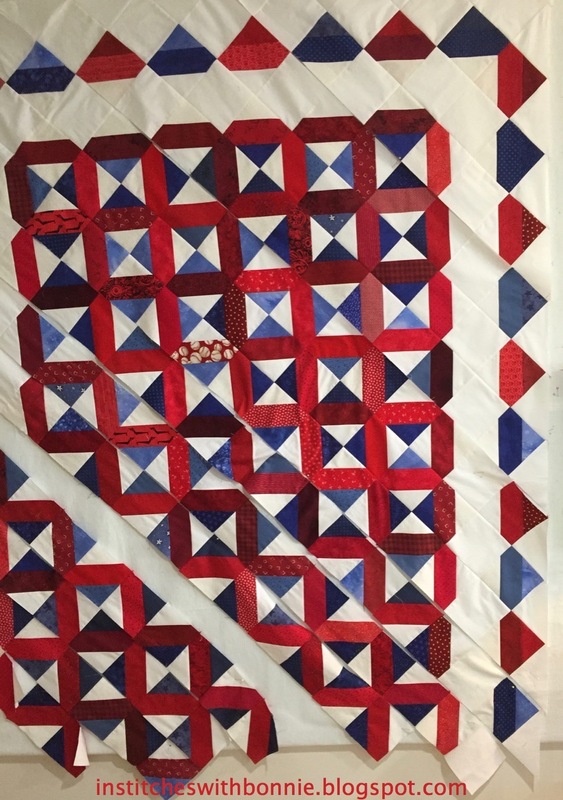 Hope you've had lots of time to stitch and work on your quilt along project. I love quilt alongs, but have to pick and choose which ones I want to do, otherwise I'd never finish anything!